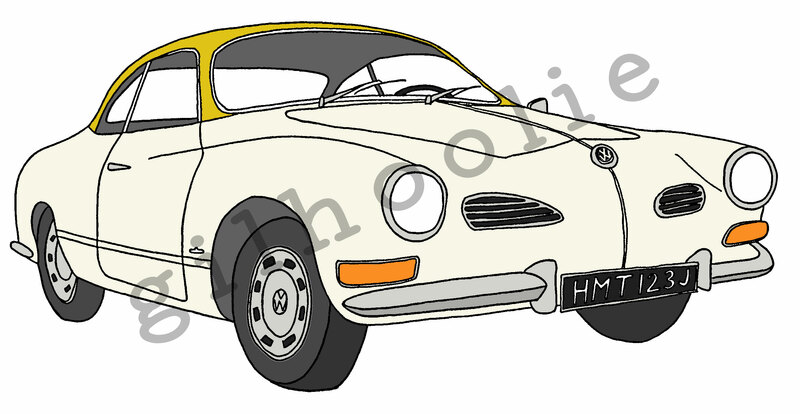 Last week I was asked to draw a picture of a 1971 VW Karmann Ghia car for a father’s day present. It’s a beautiful classic car and I thought it would look best if I drew it in ink first and then coloured it in PhotoShop. So this is the first drawing I have officially done this for a client – giclee printed onto 310gsm Hahnemuhle German etching paper. I think it came out really well; much more interesting than a line drawing and really fun to do. Hopefully it’s the first of many commissions, but don’t ask me to draw your pets or family members, inanimate objects only please! Happy father’s day to all the dads out there!